150 Cheers for Pi Kappa Alpha’s Founder’s Day at Birch Hill! On March 24th, 160 vibrant college students and RPI alumni filled our Columbia Ballroom decked out with Pi Kappa Alpha’s unique style. Returning to Birch Hill Estate for the third year to celebrate with a Founder’s Day formal, this frat is always keen to party in exciting new ways. From enjoying drinks on the private patio with a 15-foot fire-wall to saying cheers by an elaborate food display, check out how Pi Kappa Alpha commemorated their 150th anniversary with Birch Hill Catering. 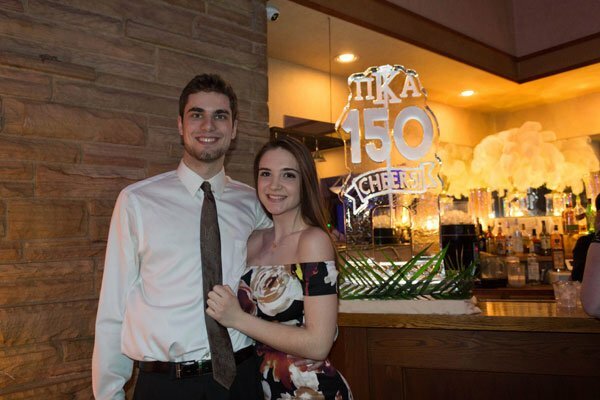 Pi Kappa Alpha’s personal Birch Hill event coordinator knew this year’s party would be an exceptionally significant one—calling for some serious upgrades to their custom menu and décor. To celebrate 150 years since the fraternity’s founding, Pi Kappa Alpha chose a 150 cheers theme and was open to all our creative event ideas to create a remarkable experience. To craft an extraordinary atmosphere around the 5,600-square-foot dance floor, our event designers used custom LED uplighting to augment the 30-foot cathedral ceiling with looming champagne Batiste fabric. We also helped arrange for a custom designed 150th banner that tied in the burgundy and gold color scheme and helped to signify the importance of such a huge milestone. To showcase their fraternity’s colors, Pi Kappa Alpha once again requested ivory tables with alternating burgundy and gold napkins. We also placed custom candle centerpieces to add a layer of warmth and sophistication to the tablescape. Since it was their 150th Anniversary, they wanted to add a captivating focal point. A custom ice luge that poured a delicious cranberry and vodka cocktails did just that—treating guests to an equally beautiful and tasty drink. And, of course, we also upgraded the bar—the Pina coladas are something guests look forward to every year. And knowing some would travel across the country just to attend, we would not want to disappoint them! Served with roasted garlic mashed potatoes and sautéed green beans, each beautifully presented dish was perfectly balanced. We are already looking forward to once again applying 80 years of event experience to seamlessly execute Pi Kappa Alpha’s 2019 event plans. We hope you too will give us the honor of helping you plan an unforgettable event. If you would like our dedicated experts to facilitate your event dreams, contact us online or give us a call at 518.732.4444.